I don't typically write reviews online, but some of the comments about these great headphones left me wondering if someone might want to hear my schooled opinion. I came to know Sennheiser cans while on the road mixing sound with the likes of Manhattan Transfer, Bette Midler, Beachboys, Elvis, etc. Every one of these artists were/are sticklers about every aspect of sound. The Sennheisers of the day were all that even came close to doing the job. In the decades since I have performed (over 40 years a guitarist and keyboardist) on the road and in the studio. I built my first digital studio in 1998 and have been at it in the studio ever since. I compared many brands of headphones, including some outrageously expensive ones and came back to Sennheisers and bought 6 pairs of HD265's. I also bought several different headphone amps, both tube and solid-state. I recently added a few pairs of HD 280's and have been very pleased. I don't think the 280's are better or worse than the 265's. I've spent 100's, likely 1,000's of hours reviewing mixes for commercials, etc and they are both musically very accurate. I cringed at several comments made about their bass response. These are not sub-woofers in the back of the Honda, these are for real music. No headphone is going to sound anywhere near its best without going thru a dedicated headphone amp--period. Anything apparently lacking in any frequency range on the 280's or 265's is either in your equipment (likely no headphone amp) or your ears. One reviewer mentioned the distance of the driver to your ear as an explanation. Seriously, bass frequencies are omnidirectional and I find I've got far more bass thru either set of phones, so I don't get why you'd want the drivers closer to your ears. I listen to all mixes flat thru speakers, phones, etc to check for accuracy and my only comment is that I have to back off the lows just a tad on either set to be musically accurate. Good headphone amps can be had reasonably inexpensively. I bought an 8 channel headphone amp with great connectivity from Behringer (not a brand I would generally consider) that sounds quite acceptable next to headphone amps costing more than 10 times as much. I want to say it was just under $200. What else to say? We live in an audio-smothered world with mostly heavily compressed, extruded music. How can we compare good cans when they're mostly being used with crappy source signals? Buy the Sennheisers! I've been reading the reviews here. These cans DO require the use of a headphone amp to get the right sound out of them. Yes, they do work with just about any audio device...however you'll immediately notice that the bass seems overly flat and the highs are a bit lacking. Use a device with enough power (not a laptop sound card, or Ipod....but rather a home theater reciever or sound board in a studio and you'll see why these cans get the rave reviews that they do. With the proper amount of power, these will rattle the hairs in your ear canal with very powerful (but not overly boosted) bass. Then, you'll be turning the volume down because your ears threshold for pain has been exceeded by the mids and highs. The only other cans ive listened to that can do a better job cost $800+ and CANNOT be used without a very powerful audio source. They do a reasonably good job of blocking external noise. I think the 32 db specification might be a little overstated. Efficiency is good, not the highest I've heard, but good. They are comfortable; I had no trouble listening for two hours. The fall-off in bass response is completely unacceptable. They absolutely must be used with an equalizer. Clear, detailed and natural sounding mid and upper mid range. Bass is remarkably deficient. Being a tuba player, I am very familiar with what one should hear in a recording. I listened to a recording I know to have a fairly prominent tuba, and it was almost completely absent when heard with the HD280. As a previous reviewer mentioned, the graph on headphones.com says it all. The deficiency is easily corrected with equalization with the result being enjoyable. I listened to some private, good recordings of pipe organ and orchestra. I know what the recordings sound like, and these confirmed the lack of bass in the HD 280. However, the bass fall-off is smooth and easy to address with just a simple one octave equalizer. After the quick equalizer fix, the sound is reasonably accurate and natural and easy to listen to for a long time without fatigue. I have to wonder if the padding on the ear cups is so thick that the transducers are sitting too far from the ears. If there is significant manufacturing variation in the thickness of the padding, that might explain why some people say the low bass is fine and others say it is lacking. - the sound is very, very good - to me! Like I said, they're the first I've owned but it's been a revelation. I just don't want to take them off! Thanks to the other reviewers for your comments, it really helped in the choice making..
Great sound, PERFECT sound isolation (much better than the HD265) Good volume due to the relatively low impedance, overall an excellent headphone for the type of user like me that just wants good, decent sound behind the computer. The only thing I think may go wrong over time is the oldfashioned phonelike cable. I imagine if you stretch it a lot it may at one point start to look a bit shabby. Also, if you have a very sensitive head, you may find the pressure on your head a little bit too much. But that's a matter of opinion. I have the cable simply lying on my desk and its not stretching, so I am hoping this will ensure it wont go south on me, but this remains to be seen. So, you have been to the local store to get some headphones. Having been though the El-cheapo $ 9.99 models you are looking for something better, something that will make you feel good about your purchase. You think you're an audiophile, but, really, you just want to hear a sound that in your untrained ears will give you decent satisfaction. You skip the $ 49.99 headphones, under the assumption they are probably just a bit better or some overpriced version of worthless cans anyway - welcome to the Sennheiser Isle. I have used Sennheisers for the last 10 years. My first ones were open models, not sure which, the second ones were the HD 265, which I have used for 5 years, but due to the severe and extensive use I have subjected them to, the padded headthingos started to tear and they now look really crappy. Realising that the replacement (of just the head-pads!) would cost me over $100 on eBay, I decided it was time to get a new set of cans. These headphones, in one word, absolutely, RULE for the type of user that I am. Let me explain. What I do is constantly listen to MP3/OGG music while I work, enjoy the occasional game and now and again use the cans on a CD player. These cans give me a very pleasurable experience. Excellent reproduction, no hiss, and did I mention, excellent, totally perfect isolation. The 265's claim to be closed headphones, but really - once you have tried the 280s the word "closed" begets a whole new meaning. Taking these off is like switching worlds. So to summarize I would say to you - if you are looking for good, no questions asked headphones or use behind the computer while you work or play a game, but you do want the sound to be decent, loud and dont want to hear your overclocked jet engine spoil the music - mate, by the time you finish reading this sentence you should have pressed Buy-It-Now or be standing with your coat on ready to race to your local audio store. You know how you always read reviews and then at the end you read something like "for this price... its a great item" which makes you think hmmm ok maybe its NOT the best choice... well - at ANY price (spare for the price of diamond-coated goldplated Mick Jagger-signed headphones ;) these are a GOOD buy. They are definitely better or equal to HD 265's and cost (at least here ) 40% less. The only service I ever needed from Sennheiser was a replacement cable for my HD 265, which was not cheap but easy to get. Very, very good for a closed headphone with good isolation characteristics. I might as well be a deaf guy at the poker table and I think I'm getting better at reading body language and lip reading as a result. On my computer via my great soundcard, I can turn these up as loud as I can possibly tolerate and a don't sense any distortion. Powered by my Samsung YP-U2 Digital Media (MP3) Player at a very solid level. I have an average to slighly below average head size, and yes, these headphones do fit tightly and can be moderately uncomfortable, nonetheless, I can and do wear these for six or seven hours straight with occassional breaks and or adjustments. My intent in purchasing the Sennheiser 280 Silver was to be able to have great sound and sound isolation at a great value for use with my computer (creative x-fi, xtreme music soundcard-highly recommended by the way) and for use with an mp3 player while playing poker. After reading literally hundreds of various headphone reviews, I am very, very pleased with the Sennheiser sound. Prior to my purchase, I had also listened to other poker players headphones, including the Bose Tri-Port, and both Sony and Phillips noise cancelling. The Senn 280's are far superior to both. I listen to a wide variety of music:rock, pop, alternative, classical, jazz, blues, folk, flemenco guitar...and the 280's perform very well accross a variety of musical styles. To my ears, the Senn 280's have a generally warm, balanced sound, with very good detail. The true audiophiles can give you more descriptive explanations, but the last month of rediscovering great sound as been a true pleasure for me. 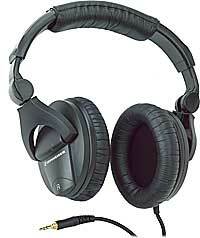 I just ordered the Senn 555's as well and will probably order Grado 60's or 80's for at home use as well. Great....ordered the black and received an e-mail saying that they were out but would be willing to substitute the Silver at the same price ($83 total). I actually preferred the Silver, but originally didn't want to pay an extra $7 just to get the Silver, so I actually got what I wanted by accident. Pro quality and very detailed bottom to top. Matches the live session. Pro gear set is not for the masses, jogging, or fashion. Professional grade and performance phones. Excellent reproduction of sound. Exellent isolation, attenuation comparable to Bose Quiet Comfort 2 cans except in the very low frequency range. Comfortable to wear. Also very solid. Go ahead and drop them on the floor. Lacking depth in both ends of the spectrum. If you are looking for rich bass go elsewhere. If you are looking for accurate reproduction of sound without anything added stop looking and buy these cans. I'm a university professor in Paris, France and use these headphones in two ways: in the recording studio at the university and also for my commute to and from work in the subway and in the street. So these cans see both professional and personal use. Professionally I listen to voices as we record conversations in English for the French students and personally I listen to classical music and opera. First of all, for technical data and graphs on these cans (or any quality cans) please go to www.headphone.com and you will be able to create graphs comparing up to 4 sets of cans at a time. The Sennheiser HD 280 Pro is unquestionably weak on both ends of the spectrum, bass and treble, but only on the extreme ends. The midrange is very consistant and flat giving incredible reproduction of sound. Listening to an Opera recently, one that was recorded in the 1950s, I was able to hear the soft thumping sound of a helicopter or the distant creaking of wooden floorboards during the live recording. The attenuation on these cans is second only to the Bose Quiet Comfort 2 headphones which do a better job at cancelling sound but only a little bit better, particularly on the low end, otherwise for a fraction of the price you can use these cans and achieve the same thing. Again, the sound is flat for studio work and if you are looking for so-called "rich bass" you had better go elsewhere otherwise you will be disappointed. The Bose Quiet Comfort 2 is much richer. Again, please create a graph at headphone.com and you can see everything. These are very comfortable to wear, though at 4 Newtons of pressure you can feel them but this is standard for studio and professional grade cans. The Sennheiser HD 580 for example only exert 2.5 Newtons of pressure but they are not made to isolate noise from the listener. Overall they are comfortable to wear and the sound is accurately reproduced, super for studio work but weak on the far end of the bass and on the far end of the treble though I would not describe these cans as bright or tinny at all, no, not at all. The midrange is rich and complexe and the bass is present but not OVEREMPHASIZED as we are so used to nowadays with "superbass" buttons on everything. Please create your own graphs on www.headphone.com to compare these cans to other ones. Excellent for monitoring, no exagerated bass and clear highs. Excellent attenuation (they claim 32db which is like turning a jet taking off into the rumble of a passing subway train), very comfortable to wear. (I have a big head and I wear these for hours on end with no discomfort.) The sound is wonderful. The masses are turned on to studio cans and therefore they complain when there is no artificial bass thrown in or when the cans put pressure on the head. The only problem with these cans is that they are too good and have therefore crossed over into the domain of the general public who are not used to such cans. A bit like everyone driving Porsches and then complaining about the stiff ride!!! These are high performance cans that deliver, but unfortunately they won't please the masses. No inherant weakness. I read a lot of reviews complaining about the lack of bass on these headphones, and that has seemed to be the biggest complaint from many reviewers. However, I have not found that problem. These are studio cans meant to give a flat read, not a booming bass like we are so used to now. Every cheap boombox or headphone set now has some sort of bass-booster, and when we don't find that we think something is wrong, like eating food that hasn't been artificially sweetened. These cans try their best not to artificially sweeten anything and they give a fairly accurate reproduction of what is being played. The bass is there, full and rich (Pablo Casals' cello came through beautifully, as did Wagner's "Ride of the Valkyries") but where these cans shine is in the high end. I played some arias of soprano Maria Callas in several operas, and I actually had to turn down the volume because her high voice was piercingly reproduced by these cans. Amazing. Another complaint often seen is the pressure on the head. Again, these are studio cans manufactured with 6N of force to keep them pressed to the head which is part of the isolation process. I have a very big head and I did not find these uncomfortable, but if you are not used to the normal pressure of studio cans you may be surprised. These were not made for lying on your couch, but for working, though of course you can do both. Also, they are very sturdy and solid and very little to break or bend or poke through, so don't worry about them flopping around the table or even falling on the floor. They are very strong.